As you may have guessed from the title image, these swords are for both genders and for both the left and the right hand (so your left-handed Sims won’t have to fight with their off hand). They can of course be worn together with other accessories – including with each other, so your Sims can hold one sword in each hand in case they’re feeling doubly belligerent. Unfortunately, hand-held accessories tend to look not so much like they’re being held in the hand, but more like they’re… glued to the palm. 🙄 We can’t have that, of course, so I made a mini-posebox to make the Sims’ hands grasp the sword properly. Note that this only poses the hand; the rest of the Sim is free to walk, run, jump rope or do whatever else you want them to do. (I’m not sure why they would jump rope holding a longsword, but they’re your Sims. 😉 ) If you use the hand poses together with another posebox, the results may vary depending on what that other posebox is doing with the Sims’ hands, but together with animations, the hands stay posed. The poses are “one size fits all”, though, so for some swords there may be a little clipping, while the grip may be a little large for others. You’ll only notice this if you zoom in very closely on the hands, though. On to the swords! First we have two wooden swords. At first these were only for children (no, they’re not getting real longswords 😛 ), but by request I’ve now made them for all ages, including toddlers. Your toddler Sims get little mini swords, but child – elder get full-sized ones. And then we have the final sword. This is the one that is just for adults and elders – because trust me, you don’t want your teens handling this. If you’ve played TSM and got the Darkness Unleashed achievement, you’ll recognise it: it’s the Cursed Doomsword. It will cut through enemy armies like butter… but it will also consume your soul in the process. Now, I don’t know about you, but it drives me ever so slightly bonkers when I’m putting accessories on my Sims and all I have to work with is a number of bald and utterly non-descript heads (that may or may not have tooltips which may or may not just be the creator’s URL). 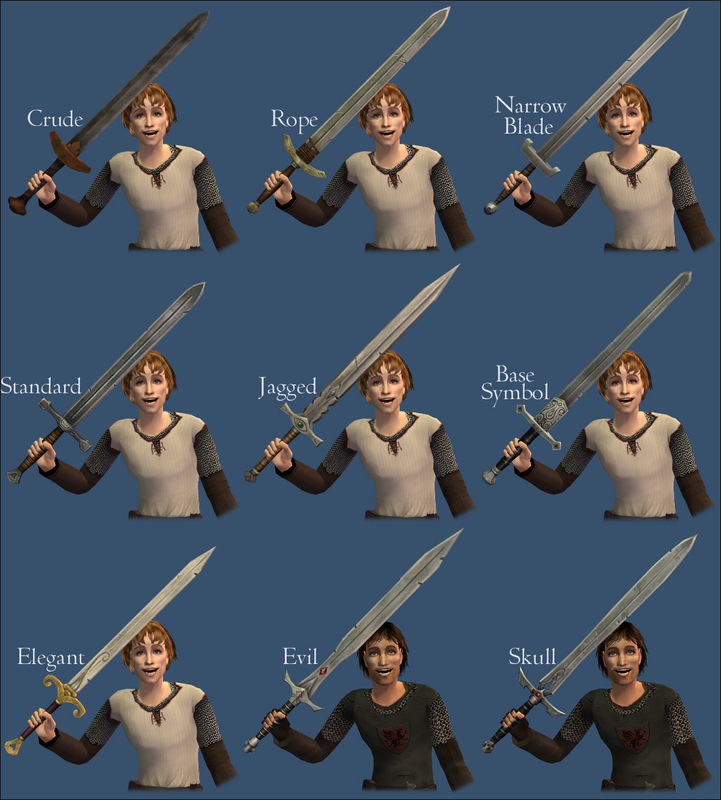 So for the sake of my sanity and yours, these swords have custom icons in game and in CAS (but not in Bodyshop) – and of course, they also have descriptive tooltips. This entry was posted on 8 November, 2013 at 17:07	and is filed under Accessories, BODY SHOP, Bodyshop, CONVERSIONS, DOWNLOADS, Medieval-ish, THEMES, TSM. You can follow any responses to this entry through the RSS 2.0 feed. You can leave a response, or trackback from your own site. YEEEEEEES! They look awesome! All of them! And they will come in so very handy! Thank you so much, Nix!!! What can I say!?! Impressive and classy you are lady. This is amazing! Thank you so much, I have been wanting something like this forever! Thank you so much! And the toddler sword is adorable! In my search for snow globes, I was directed to your site. And happy to have been! When on a site never before visited, I naturally began to peruse your wares. Oh yes, and very fine wares indeed. Thank you for these swords AND Posebox… and your other poseboxes, as well! I could kiss you. Thank you! Very useful thing! And a special thanks for not forgetting children and even toddlers! OMGGGG, I was wondering where to get a wonderful sword and here it is, and “they” are !!!! For the little kids, awwww are so adorable XD!!! I will use yours for sure in my story, putting your credits of course. Thank youuuu *0*!!!! Woo woooooo, really thank youuuuuuuuu >w<!!!! Waaaaaaaaa, of course I am interested in know what are you doing :3 … sorry I do not know how to use this sites at all u_u … but I am glad you have commented me 🙂 … yes, whenever you can continue doing it it is fine, I hope to see it when they are available and say thanks and hug you again X] … Success!!! Yay! I love that sword, it looks so evil. 😈 You can tell that whoever is wielding it means business. Ooooo….I thought I had enough. 🙂 2.0 and 2.5. Got it and own it! lol Take care my friend.